In an excellent recent article on The Guardian, Dorian Lynskey highlighted the ace work being done by a group called the English Disco Lovers, who have set about reappropriating the English Defence League's initialism and trying to gain enough online traction through Facebook and Twitter for their website to knock the hateful far-right movement off the top of Google's search results for 'EDL'. 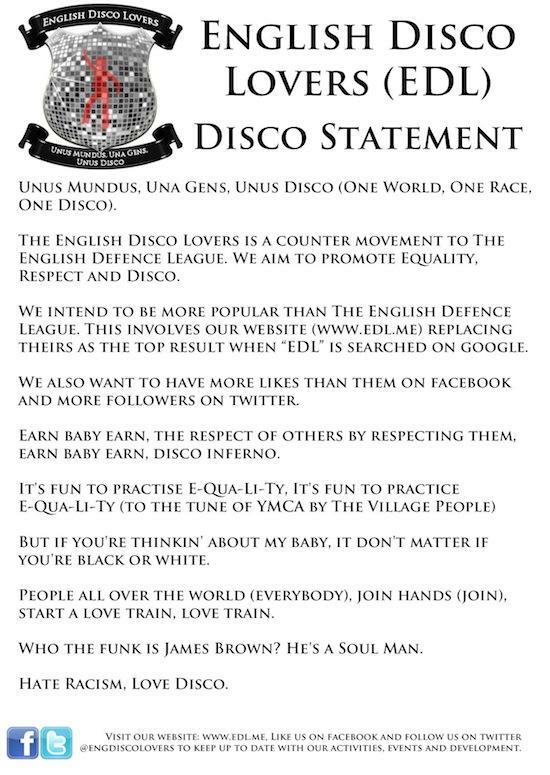 After starting out in September 2012, the group have written a manifesto (see below) and established a Latin motto, "Unus Mundus, Una Gens, Una Disco", meaning "One World, One Race, One Disco", to counter the English Defence League's. While they are retaining their anonymity, the group wrote in an e-mail to Lynskey: "I don't think any of us could say we were disco fans before, but as we've heard more and grown to understand the message, we've found ourselves identifying with it. Disco has always been a scapegoat for racism and homophobia. English Disco Lovers is turning the tables in favour of equality and respect." Their cause is growing apace, with Bristol, Northamptonshire and Leicester divisions appearing on Facebook, and consequently they're making headway on their aim: they are currently the fifth return on a Google search. We urge you to get on board and support the disco EDL by heading to their website here and giving them a Facebook like here, dealing out a potent double-whammy of furthering the disco cause and promoting righteousness.